The nearby Sierra Nevada Mountains and deserts make this a great area for people who like the outdoors. 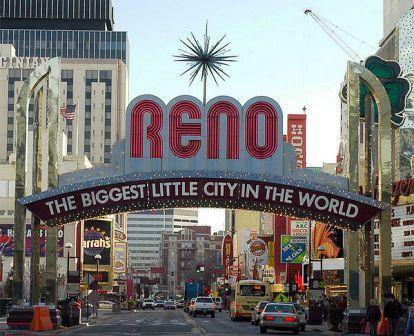 Reno, "The Biggest Little City in the World", is the 4th largest city in Nevada with a population of about 220,000. It is near the slightly smaller city of Sparks in the northwest corner of Nevada. Reno came to fame in the 20th century when people from the east, particularly New Yorkers, came here to get a quick divorce. Gambling is very important to Reno's economy, although it is no longer the gambling capital of Nevada. The larger and more successful hotel casinos include the Atlantis, the Peppermill and the Grand Sierra Resort.The downtown has had some renewal work since several casinos closed. 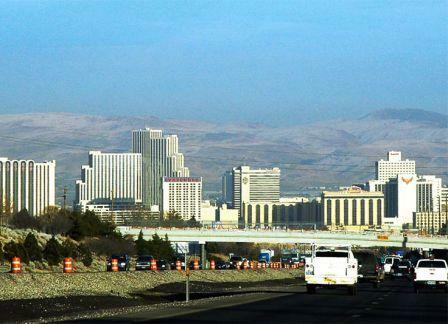 University of Nevada-Reno and Truckee Community College make Reno a college town. It has a full supply of cultural and sporting venues. In 2004, the city completed a $1.5 million whitewater park on the Truckee River in downtown Reno - the facility now attracts paddlers from all over the region. There are 18 ski areas within 2 hours. Reno is near 3 major bodies of water - Lake Tahoe, the Truckee River, and Pyramid Lake. Some of the larger buildings in the downtown buildings such as the Comstock have been converted to residential use.There are many new developments here, some of which have problems with foreclosures and defaults. Some are for people of all ages, while others are more for active adults and 55+. (see link at left). Nevada has been one of the hardest hit states in the recession of 2008-10. According to the National Association of Realtors the median home value in Reno/Sparks had dropped to about $156,600 in mid 2011. By the first quarter of 2016, the median home sale price had recovered to $291,400, and by the the second quarter of 2018, it had risen to $386,400. Nevada is a tax paradise with no state income tax and the 49th highest tax burden. See our mini-guide to Nevada retirement. Reno is very windy and dry. Thanks to overbuilding, there are a lot foreclosures and unemployed. Some people are upset about crime in Reno. Reno is the northwest corner of Nevada very near the city of Sparks. It sits in the rain shadow of the Sierra Nevada, so it only gets about 7" of rain per year. The average July high temperature is 91 and the average January low is 22. The wettest month is January (1"). Reno has a full range of cultural institutions including museums, orchestras, galleries, the Nevada Shakespeare Company, the Pioneer Center for the Performing Arts, and an active library system. Reno holds several events and festivals throughout the year. They include Hot August Nights, which is a classic car convention. There are also minor league teams for most professional sports. The City-Data.com Crime Index in Reno is 420 vs. the national index of 320. It is higher than the U.S. average in all categories of crime. Reno has an active bus transportation system, RTC Ride. Amtrak serves Reno. The Reno/Lake Tahoe Airport provides convenient air service. Reno is about average in walkability and biking when compared to other communities.